In the year 2100, humanity is remaking itself using mature biotechnology – and creating new kinds of living things. 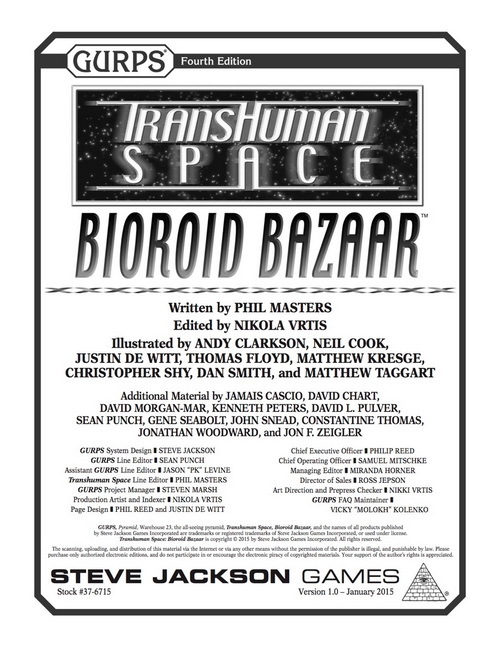 Transhuman Space gamers have the option to play genetically edited human upgrades, enhanced or specialized parahumans, or completely synthetic bioroids. Even if they don't decide to tamper with genetics, they'll encounter plenty of modified beings walking down the street or flying spaceships. From the ocean depths to the Arctic wastes, and outward from there to the "Flying Dome" of Luna City and comet herder ships in the Outer System, biotechnology is changing what it means to be human – or more (or less) than human. Come, see what's on the market in the Bioroid Bazaar! 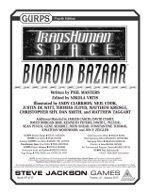 Transhuman Space: Bio-Tech 2100 – Expand your knowledge of the biotechnical side of Transhuman Space, with setting information and GURPS material that looks more extensively at upgrades, parahumans, uplifts, bioroids, and bioshells.